Levels of a protein in the blood associated with heart disease are also linked to early-stage brain damage, according to a study appearing online, December 7, in the journal Radiology. We found that higher serum levels of NT-proBNP were associated with smaller brain volumes, in particular with smaller gray matter volume, and with poorer organization of the brain’s white matter. Levels of a protein in the blood associated with heart disease are also linked to early-stage brain damage, according to a study appearing online in the journal Radiology. Heart disease and brain disease exact a major burden on society, and the incidence is expected to increase significantly due to the rapidly aging population. Damage to both organs often occurs at a subclinical stage, or before signs and symptoms of disease are evident. A substance, or marker, in the blood indicative of subclinical heart disease and brain diseases like stroke and dementia could speed the initiation of treatments and lifestyle changes, potentially slowing or even reversing the disease’s course. One promising marker is N-terminal Pro-B-type natriuretic peptide (NT-proBNP), a protein released into the blood in response to cardiac wall stress. Blood serum levels of NT-proBNP rise when heart failure worsens and drop when it gets better. 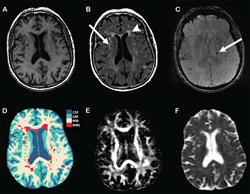 While previous studies have shown a link between heart disease and brain disease, less is known about the association between NT-proBNP and the entire spectrum of imaging markers of subclinical brain damage, like brain volume and white matter integrity. Researchers from the Netherlands recently investigated this association in 2,397 community-dwelling middle-aged and elderly non-demented people without a clinical diagnosis of heart disease. The patients were drawn from the landmark Rotterdam Study, an ongoing, population-based study of more than 10,000 people from a suburb of Rotterdam, the Netherlands. When the researchers compared serum levels of NT-proBNP with MRI findings, they discovered a clear association between higher NT-proBNP levels and brain damage. “We found that higher serum levels of NT-proBNP were associated with smaller brain volumes, in particular with smaller gray matter volume, and with poorer organization of the brain’s white matter,” said Meike W. Vernooij, M.D., Ph.D., the study’s lead author and a neuroradiologist at Erasmus MC University Medical Center in Rotterdam. The findings imply a close link between the heart and brain even in presumably healthy individuals, Dr. Vernooij said. There are several hypotheses to explain the link between cardiac dysfunction and subclinical brain damage, according to Dr. Vernooij. For instance, decreases in blood flow could lead to cerebral microvascular damage or problems in the function of the blood-brain barrier, a network of blood vessels that allow essential nutrients into the brain while blocking potentially harmful substances. Inflammatory factors associated with cardiac stress could also harm the barrier, leading to increased permeability and damage to the brain. While NT-proBNP is currently used in a clinical setting to rule out heart failure, it is too early to say if it can play a similar role for subclinical brain damage, as the new study only looked at people at one point in time. Further research, including follow-up brain MRI studies and measurements of NT-proBNP, will be needed to clarify the relationship between cardiac dysfunction and subclinical brain disease, the researchers said. “N-Terminal Pro-B-Type Natriuretic Peptide and Subclinical Brain Damage in the General Population.” Collaborating with Dr. Vernooij were Hazel I. Zonneveld, M.D., M. Arfan Ikram, M.D., Ph.D., Albert Hofman, M.D., Ph.D., Wiro J. Niessen, Ph.D., Aad van der Lugt, M.D., Ph.D., Gabriel P. Krestin, M.D., Ph.D., and Oscar H. Franco, M.D., Ph.D.